Today we are announcing the latest LensMechanix release, 18.9 which enables optomechanical engineers to load a wider range of OpticStudio files into LensMechanix—including files with off-axis components, such as reflective systems—and run multiple ray traces for all configurations with fewer clicks. 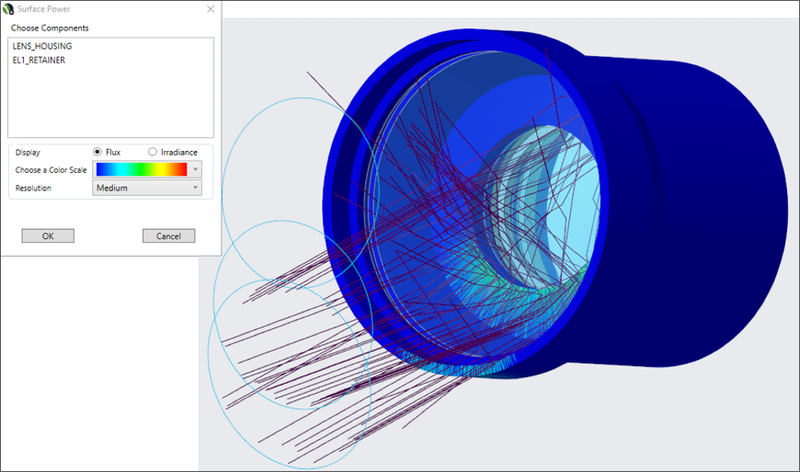 With the new version of LensMechanix for Creo, users can now identify the power incident on mechanical components to validate system performance. In addition, they can easily position the optical system within an existing mechanical assembly. Load a wider range of OpticStudio files into LensMechanix: LensMechanix now supports the Compound lens, Boolean Native object, and components that convert to Grid Sag. When loading an OpticStudio file, LensMechanix creates the component geometry of the supported components after the conversion to non-sequential. Access the release notes for SOLIDWORKS or Creo and descriptions of the supported components. Convert and load off-axis components: Now, with support of the Grid Sag component, users can load optical systems that have off-axis lenses such as some head up displays, mirrors with finite substrates, surfaces with decentered apertures, and more complex aspheric surfaces. Run multiple ray traces for all configurations with fewer clicks: Engineers now have the option of running multiple ray traces for all configurations with fewer clicks. In previous versions, users had to create a prototype for each configuration and run a ray trace for an individual configuration. Now, users can select the configurations they want to run a ray trace for and see results for the different configurations faster than before. Surface power: Engineers can now view the power incident on any mechanical or optical component, as well as the flux and irradiance on any specific component at different resolutions. Viewing the power loss can help determine which faces of the mechanical component are causing power loss in a system so that it’s possible to make changes to the geometry or apply more absorbent scatter profiles. Position with references: With the new release, when loading an OpticStudio file into Creo, optomechanical engineers can load the optical system as a floating assembly, easily dragging and positioning the optical assembly within an existing mechanical model without having to manually float or fix components. This can ensure that optomechanical designers can position the optical assembly in the correct position if they are working with an existing CAD assembly. Experience performance improvements with large assemblies: Loading times and assembly responsiveness has been improved while working with large SOLIDWORKS assemblies. Performance improvements were seen with assemblies of up to 750 components.